“To my mind, the greatest reward and luxury of travel is to be able to experience everyday things as if for the first time, to be in a position in which almost nothing is so familiar it is taken for granted.” wrote Bill Bryson, one of my favourite authors. 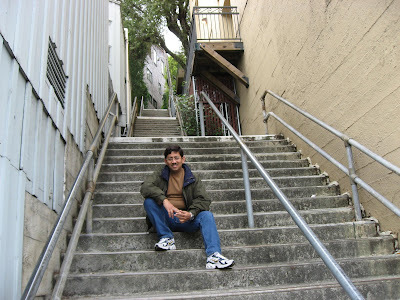 In 2008, I was enriched by my travel to many new destinations around the world: Bangkok, Beijing, Vienna, Salzburg, New Orleans, and the Bahamas. I re-discovered Mumbai, Chennai, Bangalore, Delhi and Hyderabad as I continued my culinary journey through these cities. Also, I had another dream vacation in lovely Goa just before the rains came down. 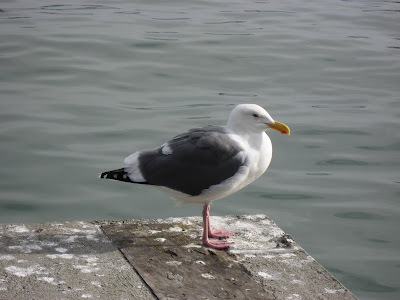 This year, I dined at some excellent places in Vegas, and ate my way through San Francisco and the Silicon Valley. The highlights? Thomas Keller's Bouchon, Chez TJ, Ame, Boulevard, Mantra, Slanted Door, Archipelago, Junnoon, One Market, Bong Su and Alexander's. During this year-end, there are fewer parties and the mood is sombre. The global economic woes and the terrible events of Mumbai just a month back have cast a pall of gloom. Hopefully, the worst is behind us, and the New Year will bring good cheer. I expect to ring in the New Year at home with family. For Christmas, I brought home a freshly baked loaf of Stollen along with the mandatory Plum Cake. 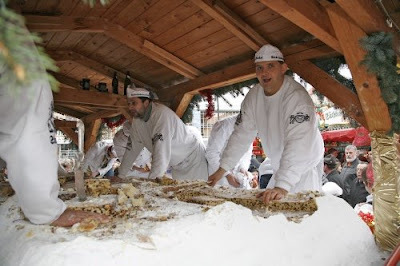 This German fruitcake, a Christmas speciality, is made of candied orange-peel, rum-soaked raisins, almonds, other dry fruits, and covered with powdered sugar. The Stollen turned out quite amazing. I bought this fruitcake at Just Baked, located on Dhole Patil Road. Wish you all a Very Happy Holiday Season and An Exciting 2009! The new discovery this week was the Laguna. 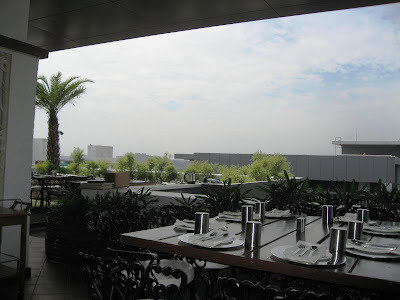 Part of a multi-cuisine complex, this restaurant serves Mediterranean food in a terrace-top, open air setting. 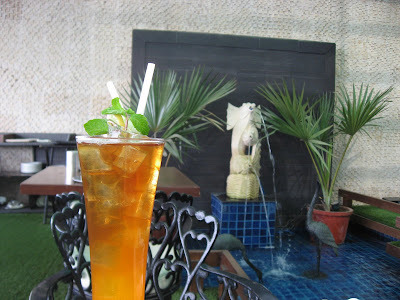 Its sister restaurant, Exotica, located right next door serves Indian cuisine in an equally nice place. They also have a nightclub called Aquaa which opens during the evening. As you can see from the pictures (taking during daytime), this is a great place. I am sure the night-time ambiance must be terrific too. I ordered a Chicken Shawarma and was instantly impressed when it was served. 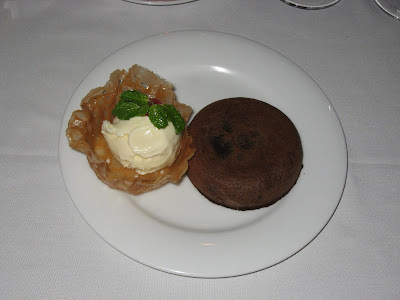 Not only did it taste great, the presentation of their food is very good too! 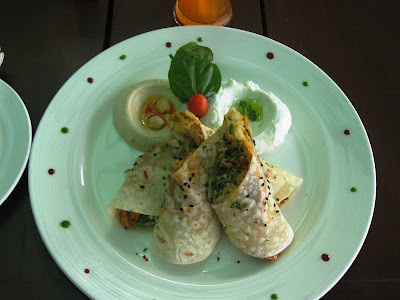 The Shawarma is a yogurt-cardamom marinated chicken that is wrapped in a pita bread. The hummus and cheese-cream that accompanied the dish were excellent. Had I known how big the Shawarma would be, I may not have ordered the pasta. But the deed had been done. While I couldn't finish the pasta, I found it excellent! 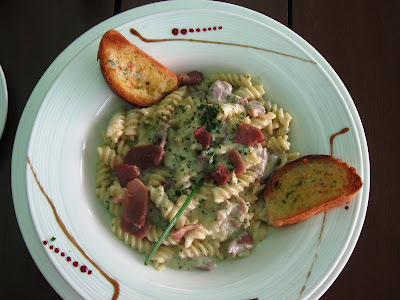 The Fusilli Carbonara was made with with crispy bacon, egg, cream and cheese sauce. Again, they had plated the dish very nicely with slices of garlic bread adorning it. I have to be back here again, this time with the family and during the evening! BTW, this place is probably a good choice even for a drink or two at the bar. The bar is located right between the restaurants and you can get a view of the city below as you nurse your drink! This restaurant is located in Panchshil Tech Park, in the road that connects Jail Road to Nagar Road in Yerwada. If you are going towards the airport, you have to turn right at the crossing just before the Golf Course. 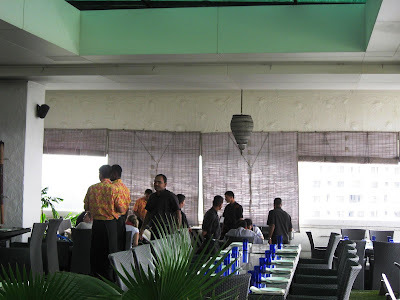 The restaurant is located on the 7th floor of Tower C, one of the shiny steel and glass buildings in this complex. The other restaurant I was able to finally visit was Casanova. This fine-dining Italian restaurant opened with much fanfare last year. It was a Sunday evening and I had called ahead to make a reservation. They warned me the music would be loud tonight since they had a guest DJ playing house music. That wasn't a problem since I was dining alone - my family is visiting the in-laws this week. The dining area is chic and contemporary with a small dance floor at one end. Dim lights, candles on the tables, and mood lighting in the bar area gives this place lots of atmosphere. The china and flatware were of very good quality too. With the right kind of music, this could be a great place for a quiet, intimate dinner for two. 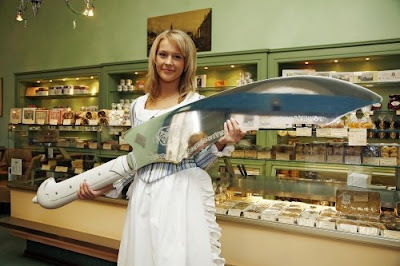 I ordered a starter from the Antipasti section. 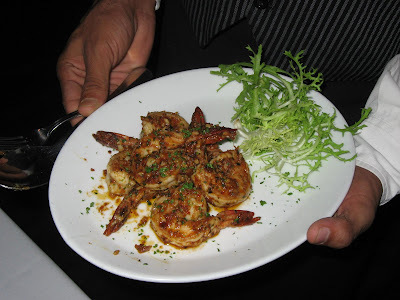 The Gambaretti Malagan is a dish of char-grilled prawns with Italian cold-pressed olive oil, garlic, chilli flakes, tomato sauce and a dash of white wine. As I glad the dinner began on the right note! The prawns were large, fresh, and crunchy; the coarsely grated garlic in the sauce along with the olive oil considerably enhanced the taste. This dish paired rather well with my glass of Grover’s Sauvignon Blanc. I had ordered the Tortelloni con Salsa de Agnello from the Risotto & Pasta section. 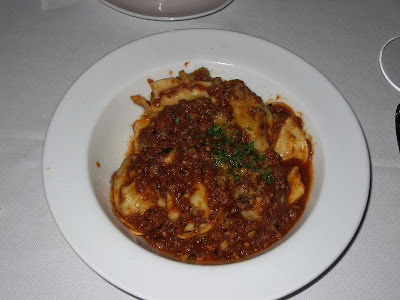 The tortelloni was stuffed with minced lamb, Italian herbs, and served in a fresh tomato, red wine and lamb ragu. This dish was pretty good too with a liberal helping of minced lamb in the sauce! The waiters were prompt and the service quality was good throughout. 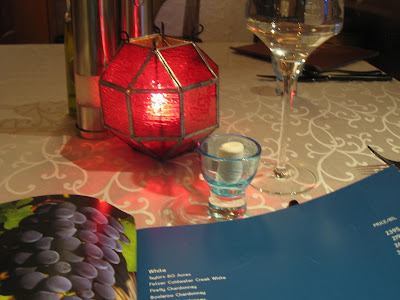 The menu is quite comprehensive and they also have a pretty good wine list. I have seen critical comments on the service quality and about the 'loud' owner/manager. Fortunately, I have no such horror stories to share! There probably aren't enough patrons in Pune for an Italian fine-dining experience, which would explain the need for guest DJs and louder dance music during weekends to bring in the younger crowd. 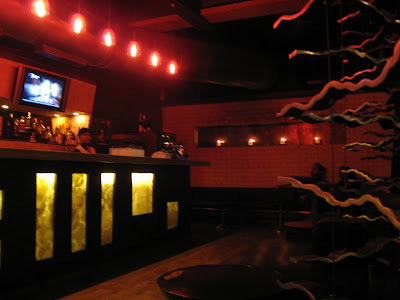 Casanova is located in the Fortaleza Shopping Complex opposite the BIG Gold multiplex in Kalyani Nagar. Ph: 2660-8888. 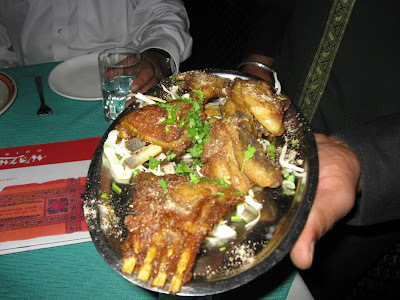 Please check the side-bar under Pune Posts for other reviews of Pune restaurants. I would love to hear your views of these restaurants too. With increasing competition from new restaurants some of the older ones are beginning to feel the heat. After Bombay Brasserie, Flags seems to be the latest casualty; this restaurant appears to have closed. And as I looked on incredulously, workers at La Dolce Vita put up a new banner over the restaurant announcing Indian, Chinese, Italian and Thai - all in the same place. Like the neighbourhood dhabas did a long time back. Sigh! 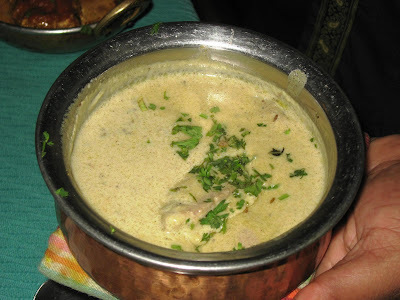 Until recent times, Wazwan was the only place in Pune for authentic Kashmiri cusine (now there are two more). I was here recently for a business lunch, and found the place empty of patrons even during peak lunch hour. However, the food continues to be quite good. The best from today's lunch was the Rogan Josh, Dum Aloo and Yakhni Pulao. 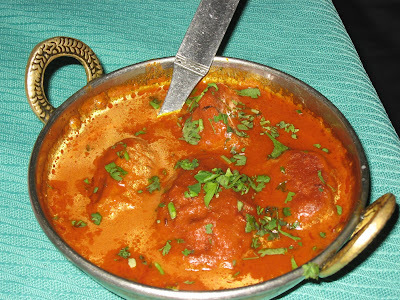 Kashmiris, unlike most North Indians, do not use tomato or onion-based sauces to cook their meat. The Rogan Josh has a thin sauce, whose rich red color comes from red chillies and saffron, both common ingredients of Kashmiri cooking. The yogurt sauce of the Gustaba was a tad too sour today; I usually love this dish made of mutton mince that is beaten into tight balls before being cooked in a fragrant yogurt sauce. 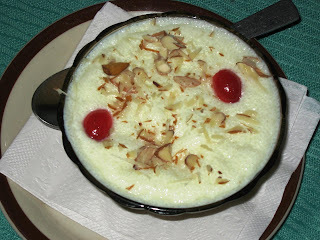 The phirni - a dessert of of powdered rice and condensed milk that is sweetened, chilled before serving - was pretty good too. Incidentally, Casanova Gold has been getting poor reviews for service, in spite of its upscale positioning and prices. If true, Wazwan will continue to be the best bet for Kashmiri cuisine in Pune for some more time. 'One', a relatively new resto-lounge with music and a dance floor, has morphed into a family dining place. The bar area continues to be popular with the youngsters, but clearly the increasing number of lounges and bars in Pune are beginning to have it's effect. On a Friday evening, at ten in the night, there were more 'aunties', 'uncles' and their kids in this place than young adults having fun. The dance floor was empty! 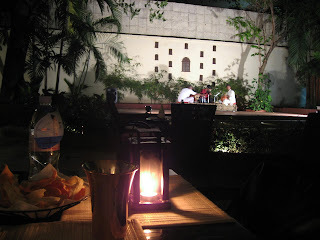 However, if all you care is the food and the open-air ambiance, you may enjoy an evening here. Potted palm trees, multi-level seating aread, and interesting lights work in it's favour. The starters are pretty good too; we didn't order entrees tonight. The cocktails here are no good at all: the Apple and Date Martini as well as the Tequila Sunrise were almost virgin (or like we say in India, more mocktail than cocktail). However, the Spicy Mexicana tequila shots were innovative and very spicy! A new discovery is Terttulia, a small bistro/cafe right next to Indyaki, at the junction of South Main Road and Lane 5 in Koregaon Park. This place, frequented by foreigners and youngsters alike, serves great western desserts (apple pies, mousse, chocolate cakes, and such), sandwiches and coffee. They have a pretty good coffee menu for those who are looking for better quality coffee than the local variety. Great place to hang out with friends. 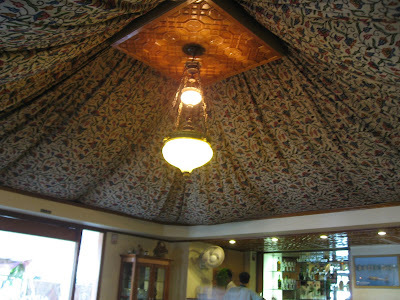 Set under a beautiful canopy of rain-trees, the natural décor is not the only thing that stands out in this restaurant. 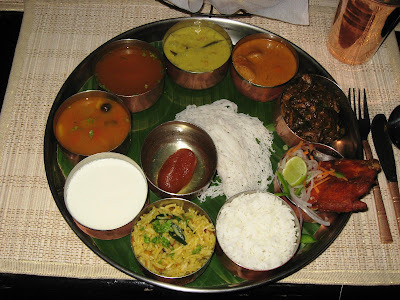 The Raintree at the Taj Connemara in Chennai serves authentic Chettinad cuisine, a rare meat-based cuisine in an area that is predominantly vegetarian. 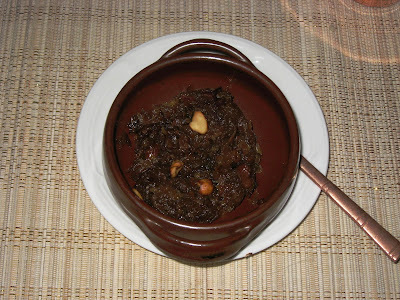 The Chettinad region is located in the southern part of Tamil Nadu and this cuisine - one of the most spiciest and most aromatic of South Indian cooking - originated from the kitchens of the Chettiars. 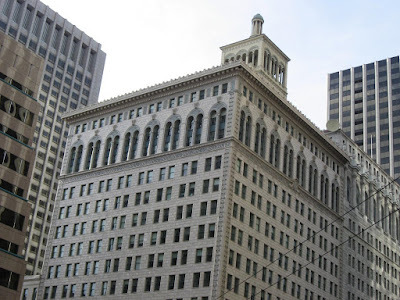 From what I can gather, the Chettiars were families of money-lenders and accountants, and their services were in much demand during the 19th century, both in India and in the Far East. I was intrigued when I heard the Raintree has been serving Chettinad food for the last 18 years; in fact, many attribute this restaurant to popularizing what one rarely found outside of Chettiar homes at that time. It had rained the week before, which was probably why the evening was so pleasant. There was a chill in the cool breeze blowing tonight. We were seated close to the open-air stage under the dark sky and surrounded by trees and string lights. As the musicians began setting up their instruments for the evening's entertainment, a pair of aachis -Chettiar women- in bright saries prepared fresh savory starters in front of us. We nibbled on these complimentary starters and sipped on Vasantha Neer - tender coconut water infused with honey and mint in a copper goblet. 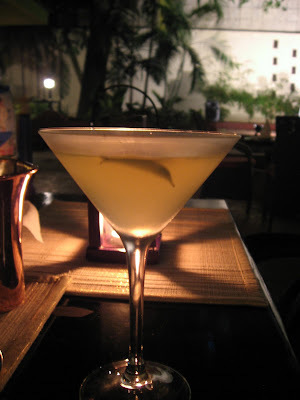 After perusing the innovative cocktails on offer, I finally settled on a karuvepilai martini infused with South Indian spices and curry leaves. My friend chose the thengai ootru, a cocktail of tender coconut, lime and sugar floated with dark rum. 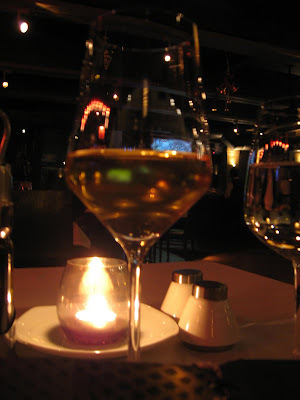 I enjoyed the martini - which went rather well with the excellent Pesarattu starter. 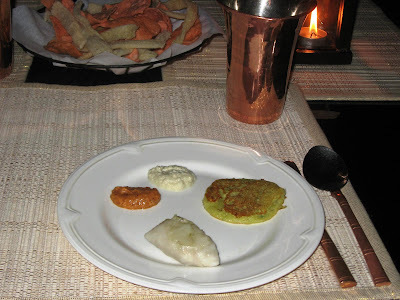 The Chef's tasting menu in the form of a thali changes every evening. Tonight, the thali consisted of Uppu Kari - boneless pieces of mutton cooked with a multitude of spices, Kozhi Melagu - very tender pieces of chicken cooked in dry pepper masala, and Meen Varuval - spicy fried seer fish. The thali also had bowls of steamed rice, lemon-rice, sambhar, rasam, curd, white pumpkins cooked in spiced yogurt and gulab jamuns. We were served fresh appams and a variety of lip-smacking chutneys, pickles and papads. We slowly savored the spicy delights as local musicians regaled us with South Indian classical music: with the flute, the mridangam, and Bharatanatyam dances. I particularly liked the Kozhi Melagu and the Meen Varuval which were promptly replenished on our plates until we could have no more. The appams were excellent, as were the many chutneys -which I enjoy most when dining in the South. Finally, we ordered an exotic dessert made of rose petals; sadly, that was the only thing tonight that didn't live up to our expectations. All in all, this was probably the best Chettinad restaurant I have eaten in. 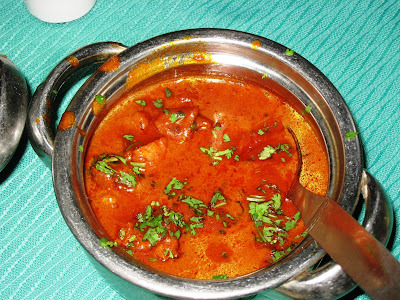 If you love spicy food, you must try this place when you are in Chennai next! 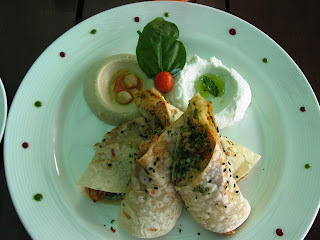 This Mediterranean restaurant at the GRT Grand Hotel in Chennai is a delight! 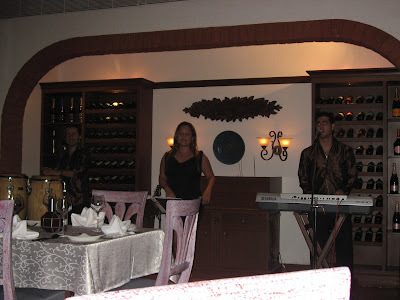 Extraordinary food, waiters in Persian attire, and a live Colombian band make for a wonderful evening. My friend is a regular here so we got personalized attention from the waitstaff. Joseph Chanine - the friendly Lebanese chef of Azulia - kept coming back to our table, to personally recommend his favorites and explain the dishes. Not only did the waitstaff dress like characters from the Arabian Nights, they also added a few 'magical' touches to accentuate the exotic: a small tablet dropped into a tiny bowl of water that 'grew' into a wet towel as it absorbed the water; a pepper mill that shone a light at the bottom giving a rather magical effect to the freshly ground pepper as it drizzled on to the plate. 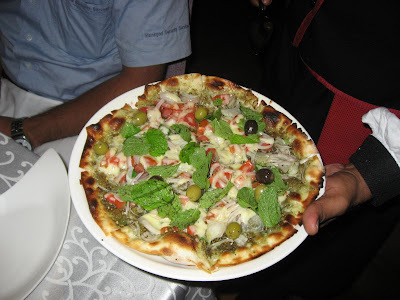 As we waited for our starters, Chef Joseph sent us his special pizza - crisp , thin-crust with olives, tomatoes, onions, basil, liberally drizzled exotic herbs and olive oil - which was fantastic. Way better than the those I enjoy at Soul or Stone Water Grill in Pune. As the Colombian band played on, they served us Soujok, Turkish home-made sausages flavored with garlic and a combination of spices in a tangy tomato sauce. 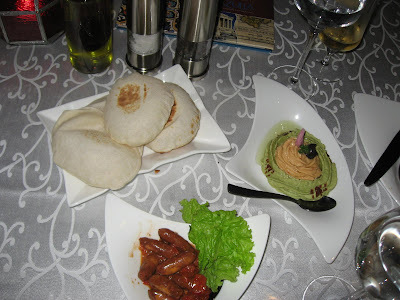 We had also ordered some pita and khabous breads and some Azulia Hummus. The Soujok was tasty and the Chef showed us the 'right' way to eat the stuff: tear the pita bread into two disks, use the tender inner surface of the bread to scoop the sausage with its sauce, dip into the hummus, and ummm! I could have feasted only the breads and hummus and been happy - they were that good. The special hummus at Azulia is blended with pimentoes, chopped pasley, lemon juice, basil and olive oil for that special taste. 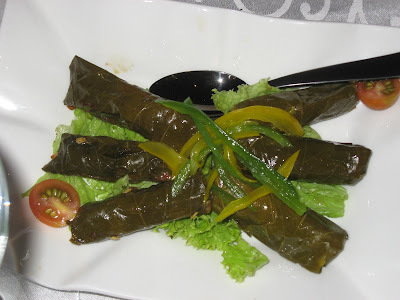 Next came the Dolmades de Vines, vine leaves stuffed with rice, diced tomatoes, parsley, mint, lemon juice, red pepper and then steamed before being drizzled with olive oil. 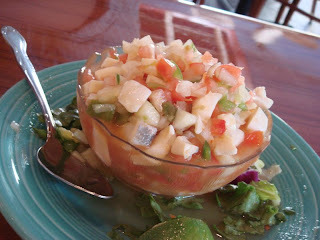 This starter was tangy and quite delightful. 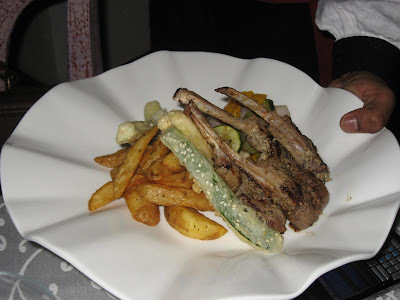 We only had enough space now to share an entree of Lamb Chops which came with wild rice and fried veggies, before which the chef sent us a palate cleanser - two scoops of sorbets: champagne/lime and strawberry? The lamb, which is imported from Australia, was excellent, but the portions are good only for one. 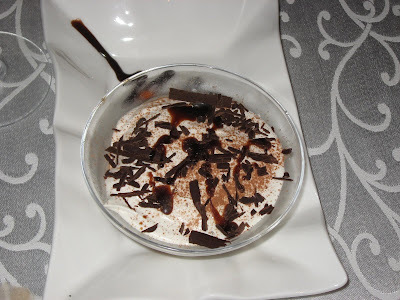 We ended with a dessert of their Tiramisu made without eggs or gelatin. The chef sent us small cups of complimentary mint tea at the end. It was midnight now and we were the last to leave. Burrp! Azulia offers culinary delights from six different countries: Lebanon, Turkey, Spain, Italy, Greece and Morocco. Chef Chanine apparently imports the flour for their breads as well as the many herbs. The menu is extensive and designed to look like a coffee-table book with interesting details about the places, food and culture of the Mediterranean. The starters are clearly the highlight of this interesting restaurant even though the lamb tonight was excellent; keep that in mind when ordering. We had about fours hours to kill at the Grand Maratha. The girl discovered all the complimentary chocolates, cumin sticks, and fruits in the room and declared this was a great hotel! 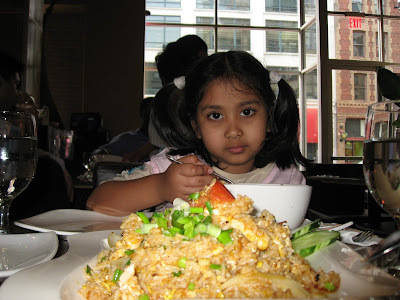 We had dinner at the Dum Pukht. 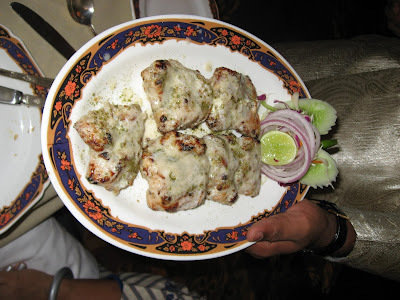 The Kakori Kababs were as good as ever; I also tried their Chandni Murgh Tikka for the first time. The Sheermal, Taftan, and Dumpukht Biryani were all excellent as usual. The check-in at Mumbai airport was quick but the wait at the lounge seemed very long, especially since this is (right now) the world's worst airport lounge. I think the common seating areas outside are more pleasant than the crowded, unclean Business Class lounge. In one of the magazines on-board, I read about users complaining about Cathay's new business class. The new configurations provide excellent privacy between seats which is good when you are alone, but if you have a companion (or more importantly, a child), you may not like the way these cabins are designed. Thankfully, we didn't have too much trouble in the new business cabins of Singapore Airlines. The girl loved all the attention (and toys) she got from the friendly cabin crew. We arrived in San Francisco an hour early and the hotel got us a room immediately even though we got in very early. 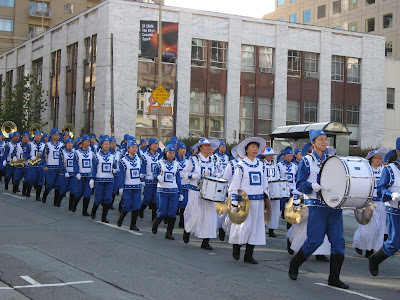 There were school-children marching past and a band playing right in front of the hotel; I have noticed many such festive weekends here during past trips too. 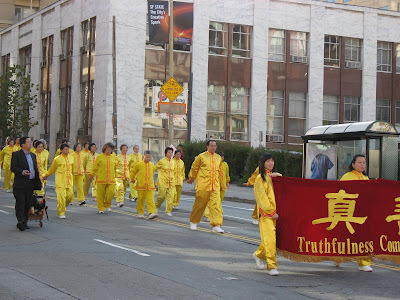 The procession on this day consisted of some Philipino war veterans, bike riders, and even some Chinese Falun Gong groups. We woke up at 3:30am. The little one happily got engrossed with Disney channel on TV which was good since it gave us time to relax, sip on hot chocolate and wait for the sun to rise as we planned for the day. Dinner at Osha's was good as always. 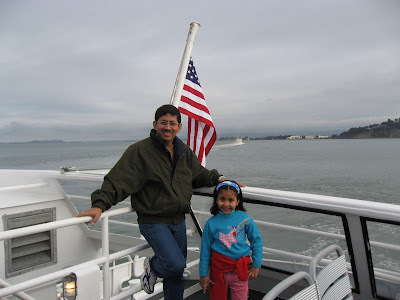 This time, the wife decided to go down memory lane by eating at Denny's, Taco Bell, and the many fast-food places we frequented when we first came to the US - we couldn't afford fancy restaurants then. 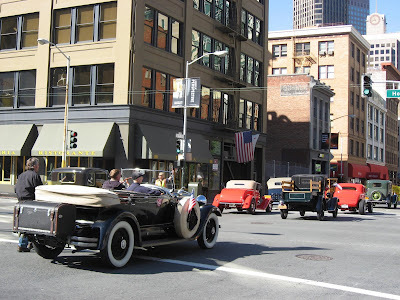 On another day we took a cab to the Ferry Building and bought tickets for the ferry to Sausalito bay. 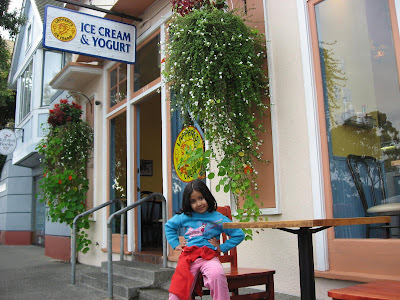 The girl happily chased pigeons and seagulls while we waited. We strolled around, shopped for some local art and hungrily finished a large dish of Icelandic cod - fish and chips tastes particularly good when the it's cold and you are ravenous! I entered a Taco Bell after ages; a long time ago, this used to be the only option for my vegetarian friends from India. After three days of lazing around in this beautiful city, we took a midnight flight to Miami and caught our connection to the Bahamas. During the flight I realized that American Airlines has better legroom than Singapore Airlines does in their coach class cabins. The small aircraft flew low over the blue-green waters as the sun shone brightly, giving us an early teaser of Paradise! Conch, which is pronounced konk, is a mollusk and a perennial local seafood favorite in the Bahamas. Unlike the slimy oyster the meat of conch is firm and white and is prepared in a variety of ways including conch chowder, conch stew, conch salad, popular conch fritters, and is also deep fried as "cracked conch". 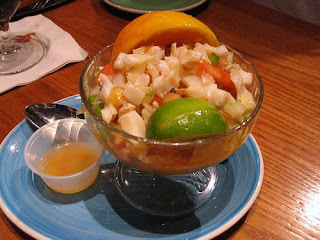 Many small eat-outs advertise conch-based delicacies all over the Bahamas, especially in the downtown area. 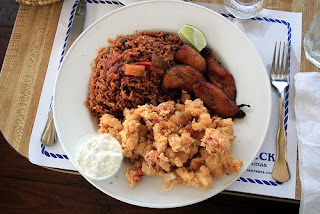 A typical Bahamian meal consists of crab and rice, delicious steamed fish, served with baked macaroni and cheese and a good helping of potato salad. 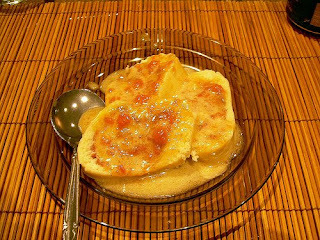 This is followed by desserts such as coconut or pineapple tart, bread pudding or guava duff, a delicious dessert that is made through a laborious process of folding the fruit into the dough and boiling and is served with a sauce. 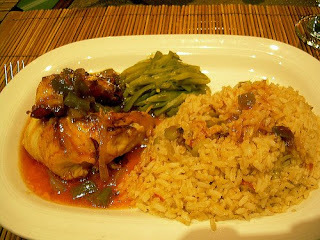 This meal is topped off with a large glass of ice cold "switcha" (lemon, sugar and water mixture) or beer. 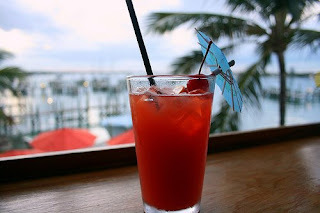 A Bahama Mama is a great tropical cocktail that features two potent rums, dark and 151 proof. The coffee and coconut liqueurs along with pineapple juice add that extra tropical touch. The ones we had at the Atlantis were very good - and mighty potent I must add. At the poolside, I stuck to the Strawberry Daiquiris. 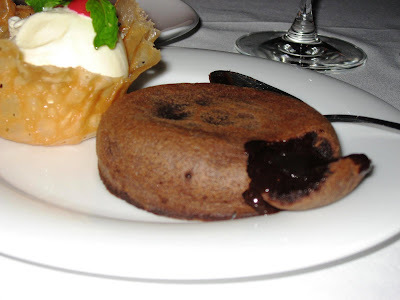 While at the Atlantis, on one day we tried the buffet breakfast at the Marketplace. In spite of the high prices, I recommend this one. The old-world ambiance coupled with the variety of breakfast options and high quality makes this a great way to begin the day. There are a multitude of fine dining options here: from the wonderful recreation of the original Cafe Martinique which serves French cuisine to Bobby Flay's Mesa Grill and the acclaimed Japanese restaurant Nobu - this one right in the Casino section. For those who would rather grab a bite between water rides, there are express take-outs that serve decent cheeseburgers, hotdogs and the like, very close to the pools. 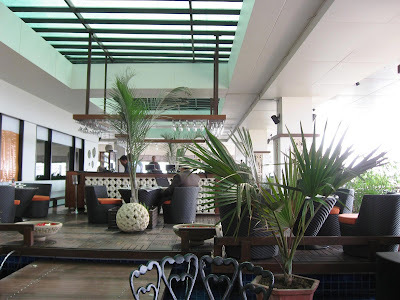 Incidentally, this resort has a total of 21 restaurants and 19 bars/lounges on its property! Other Posts from this Vacation: Arriving in Paradise, Pirates of the Caribbean.